When the transformer arrives to the Sterpin Repairing Center, it does not work anymore (the transformer... not the low-paid handyman which repares all these machines ;-)... Note Of the Translator). 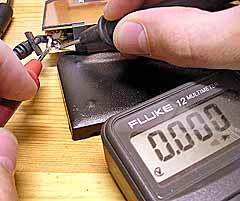 When I tested it, I discovered a tear in the cable's girdle. Not so good: if an external tear, surely an internal damage also. 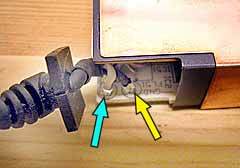 -> we open the transformer by unhooking the covers with a lever. 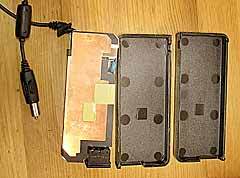 I do not believe in using an heat gun or something similar: the covers may be damaged. 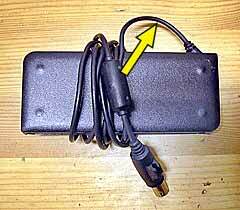 The two power cables: the yellow arrow points to the ground cable covered by a thermally retractable girdle. 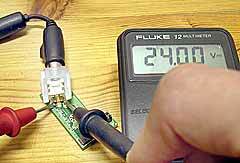 We test the circuit in-between the power output and the connector. 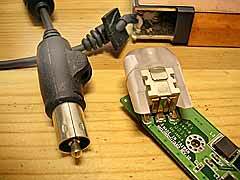 -> here I want to thank Christine (ctrl) of the powerbook-fr list which sends me a operationnal power connector. I test it: "beep"... null resistance... okay :-). 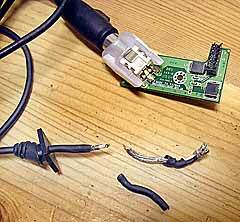 I do not change on the iBook side, but I mesure the ground cable now: still "beep" :-( ->short-circuit. 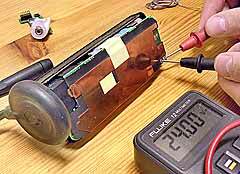 -> I unweld the cable and test the power unit without the cable and the connector. 24 Volts, it's okay. 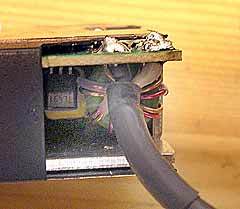 So the problem is within the cable: I have to cut off the defective area, make the cable shorter and put it back in place. Pewting the contacts (yellow arrows), cleaning the ground cable, insert a thermally retractable girdle (blue arrow) on on the main cable and another girdle (white arrow) on the ground cable. All back in place... I'm not proud at all of the right weld spot ;-). 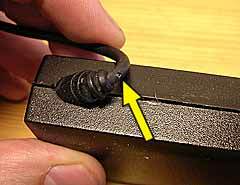 -> a tip to avoid this damage: before encircle the cable around the transformer, just create a small loop as in the picture. 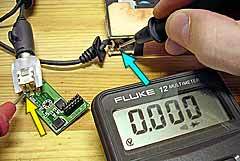 And this tip is valid for any kind of electric transformer.